Bleszinski: On-Disk DLC an "Unfortunate Reality"
Gears of War shogun, Cliff Bleszinski, reckons we're going to be stuck with on-disk DLC until game sales go totally digital. DLC is a sticky issue amongst gamers at the best of times, but when developers decide their extra content is going to eschew the "downloadable" part, well... then things get ugly. In an interview with GameSpot, Gears of War designer and grinning frat-king, Cliff Bleszinski, said that while he isn't a huge (oh, that was pretty clever) fan of on-disk DLC, he understands the reasoning behind it. "When you're making a game, and you're getting into a ship cycle, there's often three or four months where the game is basically done. And you have an idle team that needs to be working on things," he said. "And often for compatibility issues, [on] day one, some of that content does need to be on-disc. It's an ugly truth of the gaming industry. I'm not the biggest fan of having to do it, but it is one of the unfortunate realities." 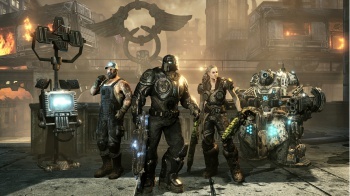 Gears of War 3 contained on-disk DLC in the form of the Horde Command Pack, which contained three maps as well as skins and other goodies. The $10 download weighed in at only 1.42MB. "If we can get to fully downloadable games, then you can just buy a $30 horror game and just have it, and that stuff will thankfully go away," he continued. Now excuse me while I shamelessly editorialize for a moment. The problem I have with on-disk DLC isn't that the concept is inherently evil, I don't think it is. In some ways it's a clever use of time and resources that would otherwise go to waste. The issue is consumer doubt. There's no feasible way for a developer to prove, at least to the people taking an issue with on-disk DLC, that the content being offered as DLC was developed in parallel rather than "cut" from the main game. The fact that the practice offers a financial incentive for developers to do exactly that is just the icing on the cake. You may now break out the car analogies. It's always car analogies for on-disk DLC right?